The table doesn't set itself, the kitchen doesn't self clean, and the kids don't always have perfect manners. This holiday season, try something that doesn't require much work but gives great results, a roast of beef in the slow cooker. Nothing could make hosting a holiday party easier or tastier than choosing Canadian beef. Start your holiday prep with glass of wine and a visit to www.beefinfo.org. There you'll find just what you've always wanted for Christmas, a meal that makes itself - well, almost. With a dedicated recipe search category just for slow cooker meals, you are sure to find the perfect meal for an intimate fireside family meal or a gaggle of good friends gathered around the table. This recipe for Roast Beef and Fennel is a great dinner idea that works well for casual entertaining. Take 30 minutes the morning of your holiday party, prep all the ingredients and walk away. By the time the kitchen is clean, the table is set and the kids are somewhat under control, dinner will be ready and the house will smell delightful. You may even have some extra time to finish your holiday wrapping. No slow cooker? No problem. 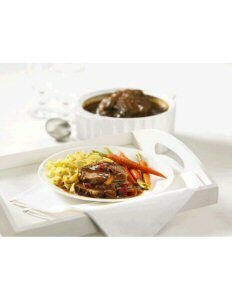 Any of the slow cooker recipes found on this site can easily adapt for traditional oven cooking. Put all the ingredients into a Dutch oven with a tight fitting lid and cook in a 325 degrees F (160 degrees C) oven. Cook pot roasts for three hours or until the roast is fork-tender. Cook stews in the oven for about an hour. If you're new to slow cooking or rediscovering your love of our favourite kitchen appliance, the two kitchen team of Canadian Living magazine and the Beef Information Centre have paired up to provide the following tips and tricks to slow cook Canadian beef best. - Look for cuts that have the words Pot Roast, Simmering or Stew on the package name. - Browning beef in a little oil before slow cooking is worth the extra effort. It brings out the best beefy flavour. - Low and slow is the way to go! High heat (even in a slow cooker) can make beef stringy and overcooked. It's best to go with the low setting. For more slow cooker tips, visit the Questions Answered Section of Beef 101 at www.beefinfo.org. This holiday season get what you really want- a no fuss, no muss holiday meal that cooks itself. Enjoy! For more slow cooker recipes, images and interview requests please contact Heather Travis. More delicious and nutritious Canadian Beef recipes and tips can be found online www.beefinfo.org.